Tree species that thrive on sites that are relatively warm and dry (less than 20 inches of rain per year) tend to dominate the dry montane forests. These species include ponderosa pine, Douglas-fir, and western larch. Both the mildest and coldest of these dry montane forests can support pure stands of Douglas-fir. 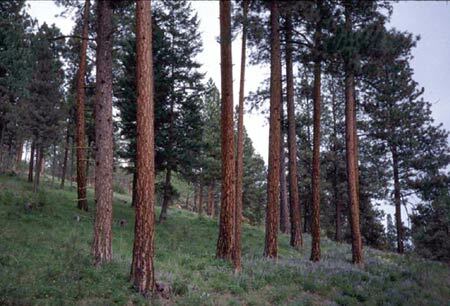 On the warmest sites, with annual rainfall a meager 11-17 inches, ponderosa pine tends to grow in pure stands. These stands become increasingly open with decreasing elevation or increasingly dry soils, until they are so sparse that they are no longer considered forests. Ponderosa pine "woodlands," in which trees are so few and widely spaced that none of their crowns touch, are common at lower timberline and typically mark the transition from forest to grassland or shrubland. This transition generally occurs within 1,000 ft of the valley base elevation, or between about 3200-5500 ft in western Montana (Arno 1979). The understories of dry montane forests are usually sparse due to the lack of moisture. Common native grasses and grass-like plants include Idaho fescue, rough fescue, bluebunch wheatgrass, pinegrass, sun sedge, and elk sedge. Forbs include arrowleaf balsamroot , lupine spp., heartleaf arnica, mountain sweetroot, and western meadowrue. Common snowberry, mountain snowberry, antelope bitterbrush, bearberry, white spirea, Oregon-grape, Saskatoon serviceberry, ninebark, russet buffaloberry, common juniper, and chokecherry are important woody species (Pfister et al. 1977, Cooper et al. 1991). 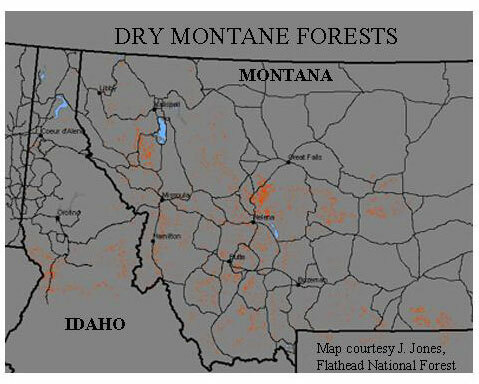 Although familiar to many folks who live or commonly travel at or near lower timberline, these dry montane forests, mapped in red above, make up a mere 4% of the total forested acreage within our focal area. A nice collection of photos of western Montana and northern Idaho forests is housed within R. E. Rosiere's Range Types of North America website under the Northern Rocky Mountain Forest section. Dry montane forest is represented in photos 59, 60, 61, 62, 63, 64, 65, 66, 69, 70, 71, 72, 75, 76, 80, 81, 82, 83, 84, 85, 86, 87, 88, 89, and 90. 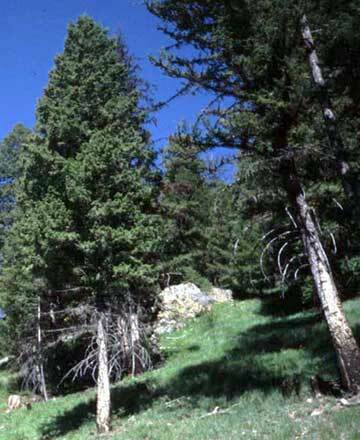 Ponderosa pine woodland is the vegetation type that Americans most commonly associate with western mountains (Peet 1988). However, the warm, dry conditions that naturally favor development and persistence of these open, park-like stands are characteristic of only a small fraction of the forested area within the northern Rockies. Douglas-fir often predominates at lower timberline in southwestern Montana, where valley base elevations are high, and winter temperatures too low for ponderosa pine. Western larch, the only deciduous conifer in the region, is an often-conspicuous component of low-elevation forests. 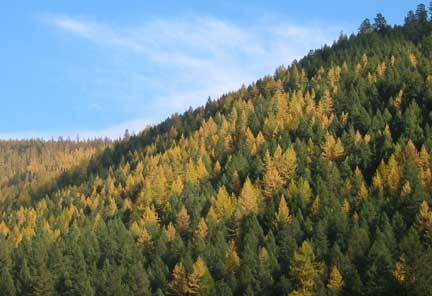 Here, larches reveal their fall colors on a Rattlesnake Valley hillside, just north of Missoula, Montana. Peet, R. K. 1988. Forests of the Rocky Mountains. Pp. 63-102 in M. G. Barbour and W. D. Billings, editors, North American Terrestrial Vegetation. Cambridge University Press, New York, New York, USA. Pfister, R. D., B. L. Kovalchik, S. F. Arno, and R. C. Presby. 1977. Forest habitat types of Montana. USDA Forest Service, Intermountain Forest and Range Experiment Station, General Technical Report, INT-34.